This is my third stay this year. I stayed here before my NCL Sun cruise in December for three nights and it was the perfect hotel as it is a short taxi ride to the cruise port. Other cruise passengers also stayed int he same hotel. It is new construction all-suite hotel, one block from Av. Corrientes which is the Broadway of BA where you find the best theaters and many restaurants, shops, bakeries, and markets. If you like to get half-priced theater tickets, the TicketsBA booth is also walking distance fromt he hotel (as it is near the Obelisk which is at the end of Av. Corrientes). It is also near the metro, banks, ATMs, a grea unisex hair salon next door, laundry service, and anything you could need before or after a cruise or on a business trip. Thetare in BA is exceptional and very reasonably priced. It is also walkign disctance to the Galerias Pacifico which is the most elegat shopping mall in BA and also where you can find the Centro Cultural Borges where they have the best and most reasonably priced TANGO SHOWS (app. $20). I have stayed in all three types of suites at this hotel: facing the street, facng the back, and the smaller suite which is where I stayed this time. All three rooms were perfect in terms of size, comfort, price, and cleanliness. My favorite were the ooms facing the street...This is my third stay this year. I stayed here before my NCL Sun cruise in December for three nights and it was the perfect hotel as it is a short taxi ride to the cruise port. Other cruise passengers also stayed int he same hotel. It is new construction all-suite hotel, one block from Av. Corrientes which is the Broadway of BA where you find the best theaters and many restaurants, shops, bakeries, and markets. If you like to get half-priced theater tickets, the TicketsBA booth is also walking distance fromt he hotel (as it is near the Obelisk which is at the end of Av. Corrientes). It is also near the metro, banks, ATMs, a grea unisex hair salon next door, laundry service, and anything you could need before or after a cruise or on a business trip. Thetare in BA is exceptional and very reasonably priced. It is also walkign disctance to the Galerias Pacifico which is the most elegat shopping mall in BA and also where you can find the Centro Cultural Borges where they have the best and most reasonably priced TANGO SHOWS (app. $20). I have stayed in all three types of suites at this hotel: facing the street, facng the back, and the smaller suite which is where I stayed this time. All three rooms were perfect in terms of size, comfort, price, and cleanliness. My favorite were the ooms facing the street as I like to look outside to see what people are wearing and to check out the weather and traffic. The room facing the back is quieter but there is nothing pleasant to see. Also, all rooms have a balcony which is another nice plus. The hotel staff is exceptional. The front desk guys could not be more helpful, polite, respectful, and welcoming. Their room cleaning staff is one of the best teams I have ever encountered. They are very efficient, you hardly see them, and have been so well trained that the rooms are always impecable. As this was my third visit in 2015, I felt like I was just coming back to my new home in BA. The beds are great and the linens and towels appropriate for a four-star hotel. I should also say that their breakfast buffet is excellent and the service staff that handles the morning breakfast is superb in terms of keeping the tables clean, the room tidy, and the buffet stocked and beautifully presented. If you are travelling with children or elderly persons this is also a great hotel. It is very comfortable and the rooms are well insulated. I never heard any of my neighbors. I also like the loation in that I was able to get my clothes washed and folded right next door where you find a reasonably priced laundry. ia lso got a haircut next to the hotel and went the the supermarkets (two of them within two blocks from the htoel) where I was able to buy cokes and bottled water to take with me ont he cruise to keep in my room. If you are going on a cruise or returning from a cruise nd need a hotel in BA, I found this one to be ideal in terms of its location, flexibility at check-in and check-out, help with finding what you may need in BA and security. I was impressed that there is always a well-dressed gentleman in the lobby in addition to front desk staff to watch who enters the hotel. Their elevators are next to the Front Desk. The wifi is OK, not great and I have siggested it be improved. There are many places in the room where there is no coverage which was disappointing. I had to walk around the room with my tablet or laptop to capture the best signal. I must also say that the bathrooms are exceptional in terms of water preasure and being equipped with American style bidets which are a luxury. The rooms have wooden floors which are easier to keep clean (vs. carpeting), and their kitchenettes are fully equipped. Anything you may need is provided. Room tip: I prefer rooms facing the street. The price you found is 13% lower than this hotel's average rate of $403/night. This is a nice place with good rooms. The room was clean and well laid out. The location is very good for a variety of activities: theaters, lots of restaurants, access to taxi's, buses, metro, and very walkable. They also provide a nice breakfast in a small dining room. The staff on check in was very friendly, helpful, and provided good local information. A couple of us speak Spanish, but others in our group only spoke English. The check in staff spoke great English. Later a staff member we had contact with was not so friendly or helpful. One night we asked for a coffee cup and some spoons. The man at the counter was straight faced and said, " no we cant provide that". We asked if a staff member could go to the dining room and get them there. He looked at us straight faced again and said, "Im sorry I cant help you". The cleaning staff was very nice. We had been traveling all over South America, and we found Buenos Aires to be noticeably LESS friendly than any other country, we had other incidents of coldness and rude people as we traveled around Buenos Aires. Not sure if that is their way, or they just dont like North Americans? The wifi in our room only worked if you stood at the entry door, otherwise we had no wifi. Overall this is a good place to stay that will provide access to a lot of activities. This hotel is a very good value for the money. It is very clean and is located close to several interesting sights (Baroli Building, National Congress), the theater/movie district, and good restaurants. 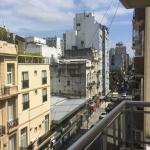 It is also within walking distance to the Casa Rosada and the Recoleta Cemetery. The San Nicolas neighborhood is an older area of Buenos Aires and is a bit ragged around the edges, but is very safe day and night. The hotel has a buffet breakfast that is OK but nothing to rave about. It features cold ham, cheese, cold cereal, various types of bread and pastries, coffee, tea, etc. There is a washer and dryer on the 9th floor. The hotel supplies the soap and provides tokens at 50 pesos each. The machines work well. The gym consists of an elliptical, a treadmill, a bicycle, and a weight machine. Not Nautilus quality but OK if you want to work out a bit. Our room had two full-size beds, mini-refrigerator and a kitchenette with table and chairs. Everything worked just fine. My only negative comment is that the WiFi is very slow, even downstairs at the 3 computer stations off the lobby. Forget about viewing a movie on your Ipad. NOTE: If you ask the desk to call you a taxi, you will get a private car and driver, not a normal black and orange taxi cab that are everywhere in the city. Unless you have luggage and and on your way to the airport (470 pesos), it is better to hail a cab yourself. We made that mistake and wound up paying a really exorbitant price for a 15-minute ride. 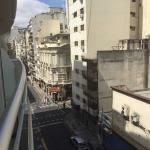 Room tip: We were on the 1st floor facing Montevideo Street and had no trouble sleeping. I have now stayed here for three times and would do it again. I like staying here because of its proximity to all major attractions and there are many nice restaurants nearby. 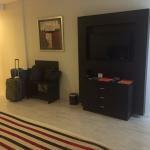 The hotel itself is very nice and clean and the staff are very helpful and friendly. The only drawback is that the gym is too small and lacks equipments. So if you're a gym freak and planning to stay for long time you might want to consider staying at some other place. Room tip: some rooms have a separate bedroom, ours had living area and small kitchen, safe in room, small terrace & great breakfast buffet daily. Wonderful Hotel, location, safety, and service! 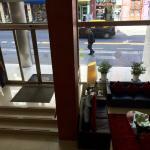 This lovely hotel is well maintained, particularly the excellent maid service we had while staying there. It is within a couple of blocks of different subte entrances, and has along Montevideo Street several kinds of eateries. Just down from the hotel there is a fruit stand that has wonderful fruits for sale. The best kept secret is the Etzio Heladeria just a block away, heading toward Corrientes. (I became an addict to the incredible flavours and blends available. The owner is a very congenial man, who takes his craft seriously. He is pleasant, and offers a small taste of the flavor of your choice to make sure you are happy before you buy. My favourite is Frambuesa) Back to the Icaro. The breakfast here is very nice, with assorted wonderful sweet and savory breads, meat, and cheese, cereals, fruit juices, fruits, freshy cooked eggs, and more. I would love to stay here again. The only negative is that the internet was sluggish most of the time. That could be attributed to the part of the city. They have multiple routers on each floor and try to provide every convenience. There is also a sauna (dry) and small weight and treadmill room on the 9th floor. This is not an over the top hotel, but was affordable, safe, and very nice to stay in.